Well hey there! Boy, do I have a treat to share with you today. Yesterday it rained here for the first time since May. And when I say “rained”, I mean FREEZING rain. It felt like mid-January, not the beginning of October. I immediately put on all my winter clothes (yoga pants and a sweatshirt) and went out to buy groceries and a box of firewood. When I got home, I lit all my pumpkin spice candles, put on pot of tea, made a roaring fire and started baking. And while I don’t necessarily know if the weather constituted such a roaring fire, the Florida girl in me loved every second of it. Someone remind me of that in two months? Okay, thanks. Now onto bread. I wanted (heaven forbid) a nice alternative to pumpkin bread. Not that there’s anything wrong with pumpkin bread but it just seems to be everywhere right now. What can I say? I like to color outside of the lines. And after an entire afternoon of mixing, testing and baking, this is what I came up with. A rather old fashioned spice loaf, slightly sweet and full of fresh grated apple, applesauce, molasses, ginger and cinnamon. On top, I drizzled a simple icing made from confectioners sugar and apple cider. Eating it makes me think of chunky cable knit sweaters, striped wool socks and little house in the big woods. Make it for someone you love! That means you! In a large bowl, whisk together the flour, salt, baking soda, baking powder, cinnamon, ginger and nutmeg. Set aside. In another large bowl, whisk together the eggs, brown sugar, molasses, butter, applesauce and grated apple. Add wet ingredients to dry and mix until just combined. Scrape batter into a greased loaf pan and bake for 1 hour 15 minutes, or until a toothpick comes out clean. Let loaf cool completely before glazing. 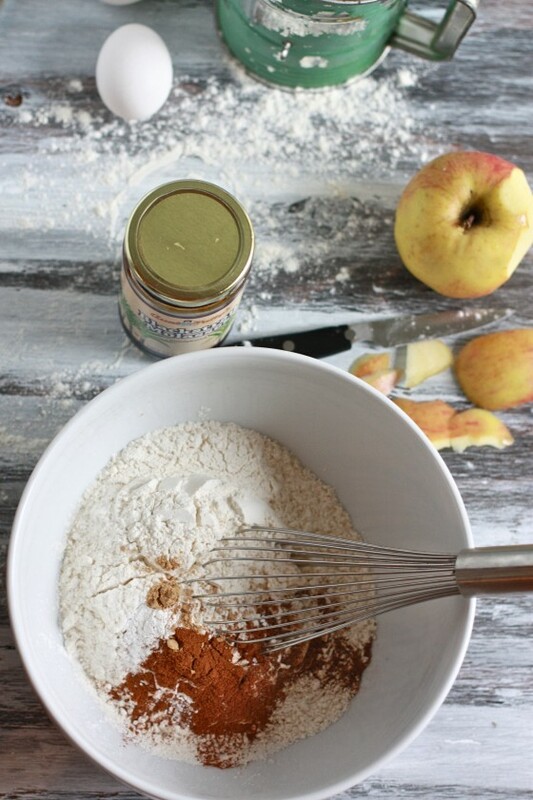 To make glaze, mix together the confectioners sugar and apple cider. Drizzle over completely cool loaf. I would love to curl up with a huge slice of that in front of the fire in sweats:-) Now, if only I had a fireplace! Oooooh that looks so delicious. I love how it photographs too, very lovely on the nice countertops. I might have to make this 🙂 have a great week! A vegan bakery nearby, called Wildflour, makes a killer seasonal apple cider cupcake with a nutmeg-based frosting. Wish I could mail you one! I’m all about molasses lately! Please tell me that Dexter is scampering around in a cable knit sweater! yum this bread is so perfect for the weather we’re having right now too! This post made me wish I had a fire to curl up in front of! This bread looks perfect for autumn – just the right combination of spices and textures to be absolutely delicious! i know this sounds so creepy but i would have paid money to come to your house yesterday…it’s hot and sunny here and freezing rain, winter clothes, fires and spiced candles are pretty much the only thing that can fix that! Beautiful! 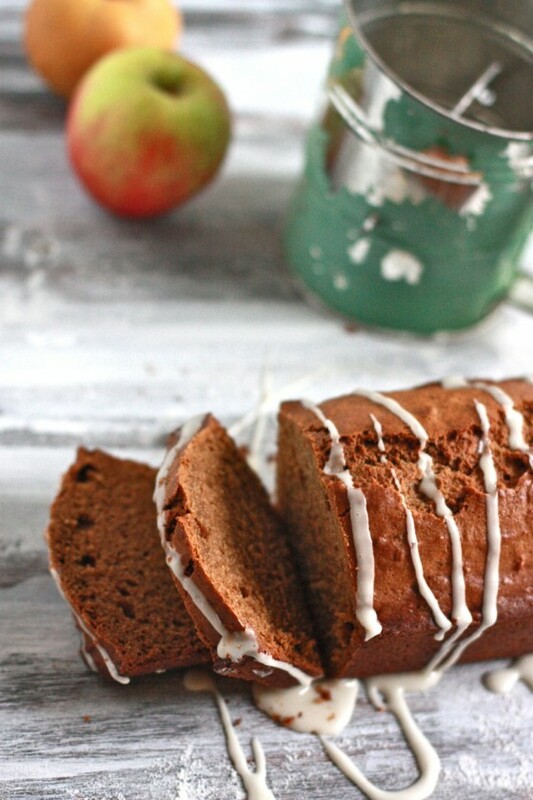 I have to admit, I jumped on the pumpkin cake/loaf train with the recipe I posted this morning, but I love apples just as much and this sounds wonderful – especially for the days I run out of pumpkin and can’t be bothered to layer up and go to the grocery store! Unfortunately I don’t think I love fall/winter clothes as much as you do! OMG I need to make this. Preferably today! You’re right–pumpkin bread is everywhere! This recipe is so refreshing! haha I love the image you create with the roaring fire and candles, it sounds so cozy and fun to bake on such a day! It’s been raining non stop here (but remind me in January when its snowing non stop that rain is a good thing) and I’ve been cooking a lot more because of that. WOW that looks amazing. I can’t wait to spend next week on a small break at home in the country. I’ll be making sure to go to the local fruit farm while i’m there to pick up some fresh apples and cider! I see baking this bread in my near future as well. Thanks! This is a great alternative to pumpkin bread! Looks delicious! Uh yeah, is there a way I can sign up for 37 slices? Bev, your comments make me laugh hysterically day in and day out. 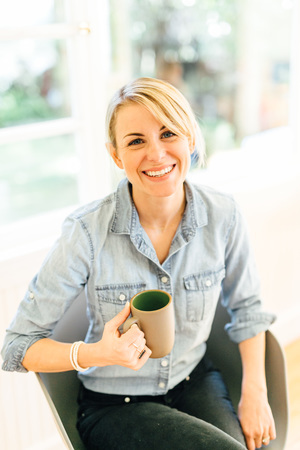 Just so you know—I appreciate you! I think this is absolutely perfect and I love the idea of your simple icing by using apple cider! That’s so creative!! Looks amazing! Honestly, I’m not a huge fan of pumpkin everything. I mean, it’s okay, but it’s not why I love fall. I love fall because of the colors and apple-cidery or apple-caramel flavored things. And sweet potato cupcakes. And Thanksgiving. Half of me wants a cold rainy weekend like that to just bake my heart out and the other half wants sun + crisp temps to enjoy the outside before we hibernate for 6 months. It’s a tough call! Yesss! My winter wardrobe consists of yoga pants and a sweatshirt too! Also: ridiculously fuzzy socks that are so thick you can’t put shoes on with them. Who needs shoes, anyway? I love this rain too! It’s the perfect loaf to give away as a gift! Great photos – love the sifter in the background. Definitely going to bookmark this recipe! How cold is it in Southern California? This weekend here (SoCal) it was still 100 degrees! Ack! Haha it’s not really *that* cold although tomorrow we are supposed to have pouring rain and a high of only 60 degrees! sounds like we’re having the same weather here in VA! I saw freezing rain/snow outside my window yesterday. Not cool. The leaves haven’t even changed yet! But I do love a big fire, candles, and apple bread 🙂 Love the glaze! Looks delicious! Love the glaze! Looks amazing! I was thinking of doing mini loaves and giving them out…what do you think the cook time would be? Hmmmmm for mini loaves, I would try 45 minutes then check to see if they’re done. Apples make me think of fall. They’re probably my favorite thing about fall…LOVE the spices in this bread…It’s kind of like an apple cider donut loaf! Yum…we just bought a bunch of gala apples and seeing how we just made your pumpkin muffins and a pumpkin roll, it might be time to switch things up! I currently live in MA, but am from NC. I seriously considered donning mittens this morning. Oh dear. Looks yummy! We’ve been having freezing cold rain like that for the past week. I do love how it makes me want to curl up with a blanket & tea by the fire, I just wish it didn’t last forever. How fall of you! And perfect for the weather y’all are having. Apple and spices together? One of my favorites! I love reading other spiced recipes too … each has their own combination of flavors. So fun! This looks great! Do you think you can substitute maple syrup or honey for brown sugar? Mmmmmm… that is such a perfect-looking loaf of bread. I want. I am making a mental note to add cider to my shopping list next week. This looks delicious, and your talk of cable knit sweaters and firewood has me longing for a cozy evening inside! Hi Jenna! This looks wonderful. What size loaf pan did you use for this recipe? Just pinned it 🙂 Always in the market for yummy comfort breads now that winter is on its way. Rain hit us yesterday and I LOVED it! Hello, amazing! I just ate, but now I’m hungry again. 🙂 Beautiful. This sounds really good, but I’m tempted to add more apple. Do you think 2 grated apples would work? Would I need to adjust the other ingredients? You could totally do that—just be sure to press all the liquid out of the grated apples with paper towels before adding them! The bread looks great and yes, a nice change-up from pumpkin is good. Pumpkin IS everywhere right now. I love the glaze you used, too. Mmmm, good! I think I’ll try that glaze on my next bread loaf. How did the Yoga Aid Challenge go over the weekend? super! as a community here, we raised 10k…so awesome! That is incredible. I find myself more and more wanting to do something in life with service. The drizzled icing is so pretty! Great alternative to pumpkin bread for sure. We just went to an orchard, and I’ve got a TON of apples that need to be put to use. How perfect! This looks soooo good. I want to make it for my mom but she doesn’t eat eggs. How do I substitute the eggs in this recipe? You could try two tablespoons of chia seeds mixed with 6 tablespoons of warm water and let to sit for 10 minutes…I haven’t personally tried that but it’s worked in other vegan breads so you might consider giving it a shot! Thanks Jenna. Will try soon and let you know how it was. AHH, I’m a FL girl too..I am longing for a rainy day and a roaring fire like yours! Jealous. 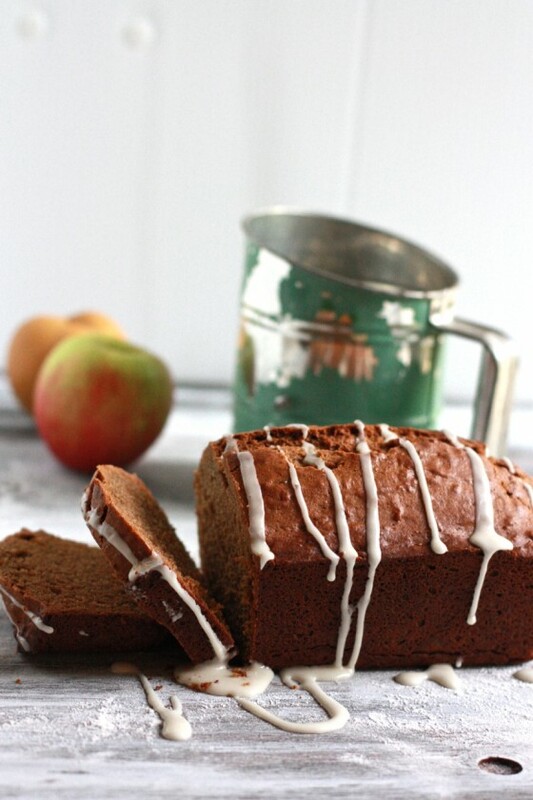 Wow, apple cider bread sounds perfect with a warm cup of tea! Love that everyone is posting apple and pumpkin recipes! 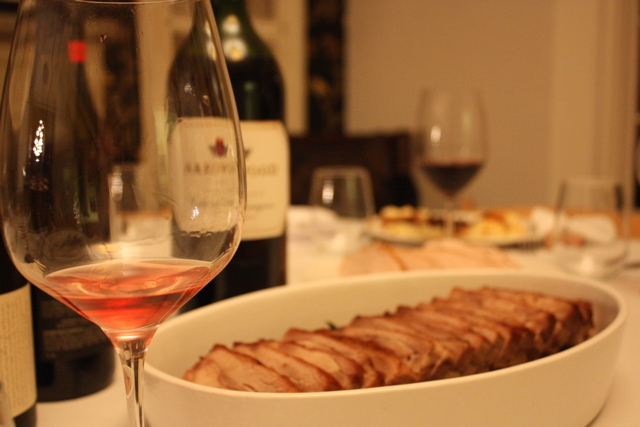 I am definitely making that to bring to thanksgiving or Christmas family gatherings! I love the focus on apple instead of pumpkin for the fall! I love pumpkin, but apple seems to be too often overlooked as a treasured fall flavor! I love that you colored outside the lines. This looks fantastic and while I love pumpkin bread, there is A LOT of it on the web right now! Um, your day sounds ideal. Baking should always accompany freezing rain, roaring fireplaces, and sweatshirts. And music. And wine. It was 90 degrees here today. Ugh. I totally felt the same way about the weather! I picked up a large bag of fresh picked apples and was determined to make an apple crisp…. with a little drizzle of strawberry! Still haven’t determined a verdict on it yet… get back to you on that one! Oh and I want at least 4 slices of your bread… with the tea you brewed… thanks! That title grabbed me! 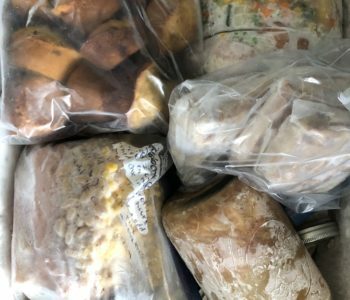 I looooove spice breads….and cakes….and muffins! Anything spiced…..and apples!?! LOOOOVE! thankful to this post for reminding me that i still have a leftover piece of my grandma’s amazing apple cake in my fridge. i went home for fall break over the weekend, and she always makes it when i come home. 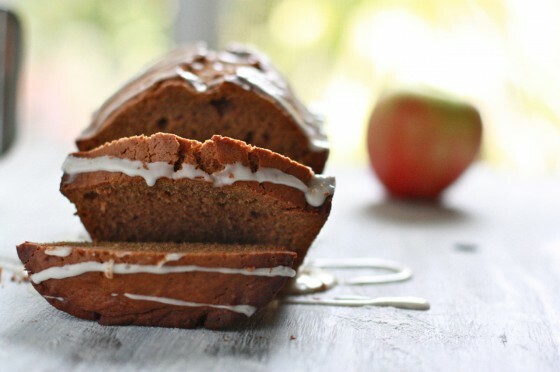 there’s just something about apples in bread… yum!! Great photo! The bread looks delicious. Do you have recommendation on a good substitute for flour in this recipe to make this gluten free? I don’t do a lot of gluten-free baking so I’m not sure and I don’t want to tell you something and be wrong! I”m sorry! I was looking for an apple cider glaze idea to spoon over banana sugar cookies. I just finished the project & the results are so delicious! While I enjoy pumpkin from time to time, I ALWAYS love apples! This is a great idea – why aren’t there more apple breads out there? 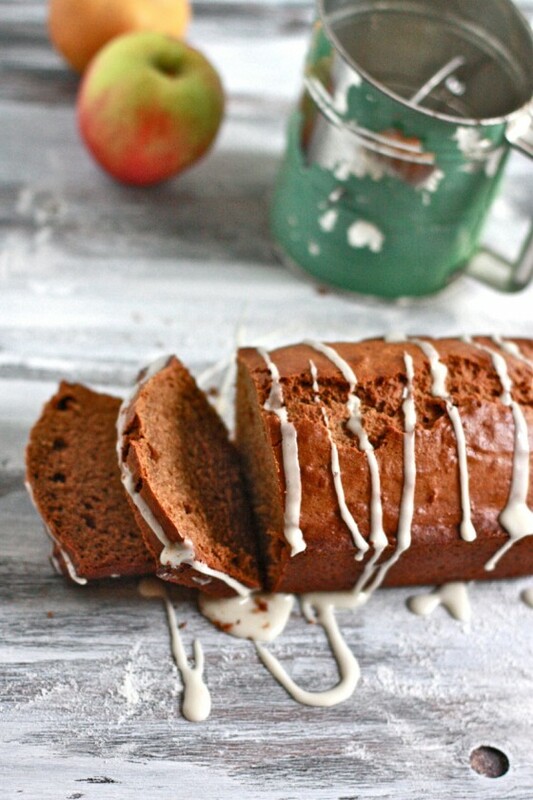 Apple Spice Bread with Apple Cider Glaze | finding a new life through food. in the air « Happily. Oh MY gosh. Just tasted the bread and it is AMAZING! So happy 🙂 Thank you for this great recipe and not only do I have good bread but my house smells so delicious!! Definitely will recommend this to friends! hi Jenna! I just threw out my applesauce (ugh!) but I really badly want to make this bread. what could I substitute? canola oil and maye add and extra apple in there? Even at 350 for 1 hr. 15 min., it was overbaked. I’ll check it at 45 minutes next time. Didn’t stop it from being eaten, however! Can you make mini muffins with this recipe instead of a loaf?